Of the Kitten Kind: OTKK Book Club & Giveaway: The Happy Herbivore Guide to Plant-Based Living by Lindsay S. Nixon. OTKK Book Club & Giveaway: The Happy Herbivore Guide to Plant-Based Living by Lindsay S. Nixon. When I originally picked up The Happy Herbivore Guide to Plant-Based Living I assumed that it was an hyperactive book touting the miracles of veganism as I have seen so many times before. I was so wrong. As I opened the pages, I was pleasantly greeted with information about Lindsay and her husband's road to health through the use of plant-based foods and as I turned the pages, a wealth of information poured out. There seems to be a general consensus in the wider ommunity that becoming vegan on it's own is a healthier lifestyle that will lead to weight loss and clear skin with boundless energy to burn. It is rarely taken into account that a tonne of junk food is still vegan. Nixon points out exactly this. That in order to be the ultimate versions of ourselves, we must focus our attention on well... ourselves, by fuelling our bodies in order that it might thrive with dense nutrients gained from a plant-based lifestyle. Honestly, I wish I had found this book before I became pregnant. The Happy Herbivore Guide covers step-by-step everything we might need to know about a plant-based lifestyle from transitioning in the first place, to dealing with friends and family that may be uncomfortable about our new lifestyles (and we have all encountered those people), to ordering takeout, to becoming pregnant, to packing school lunches and camping. And that really is just the tip of the iceberg. I really can't explain to you just how much information is packed into this easy to read and beautifully laid out book. Being beautifully laid out is a big thing for me at the moment. Lots of pretty colours and pictures jump out of this full colour book. Sometimes, too many pictures can make the book a little harder to read but this one flows really well, with excerpts about individuals living a plant based lifestyle in amongst the segmented chapters. I'm loving the revised food pyramid that Lindsay has included with starchy vegetables and whole grains at the bottom and whole fats at the top. It's easy to get confused these days with so much incorrect information and quick fixes being thrown around the internet. Having a solid reminder of real food is really the kick I need right now to get my arse into gear and looking after myself again. I'd hate to say it (purely because when I read about endorsements that are really positive, I feel like someone is trying to sell me something), but reading this book really has me inspired to start looking after myself properly. It's easy to get lost in the day to day and I'm finding that I am giving up so much of myself with my baby daughter, and I find my self deliberately putting myself last. Reading The Happy Herbivore Guide has reinforced to me that doing that to myself isn't good for anyone and that being in optimal health is where I will be able to be a better mother, wife and friend to others and to myself. I have been healthy before and I remember that feeling. I liked it. I'm going to look into buying Lindsay's other books because honestly, even though my fridge is full of vegetables, sometimes it's hard to gather inspiration on how to put them all together in a healthy and meaningful way. Lindsay has 5 other cookbooks covering subjects such as weight-loss and recipes for holidays and celebrations. The Happy Herbivore Guide to Plant-Based living has reminded me that living well is as simple as putting down the processed food and picking up something nutritious. It really is that simple, with a bit of extra chopping and cooking- but it's so do-able. In fact, Lindsay has included a number of one -pot recipes in the back of the book as a kick start to feeling good. And that's what I'm after. I don't care about looking good. Alright, maybe I do just a little. But for the main part, I want to feel good. I know that when I feel good, the world around me feels a lot more magical and I want that magic back. Thank you Lindsay S. Nixon and The Happy Herbivore Guide To Plant-Based Living for reminding me of that. 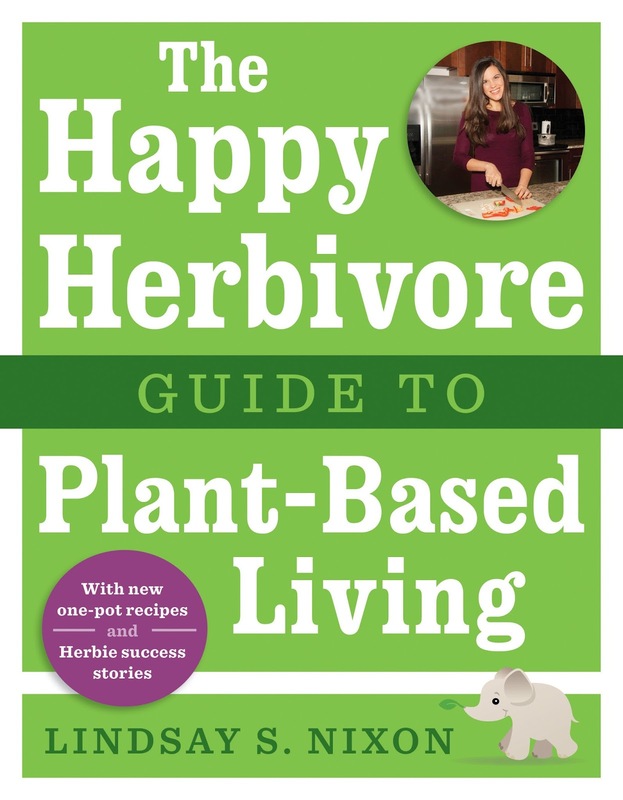 I have one copy of Lindsay S. Nixon's book The Happy Herbivore Guide to Plant-Based living to giveaway thanks to BenBella Vegan. To win, all you need to do is leave a comment on either this blog post, the OTKK Facebook post or the Instagram post. Enter as many times as you like. Sally -- The book sounds great! It is so important to take care of yourself. As moms, we do tend to put ourselves last because of a triage mentality -- there simply is not enough time for everything that is dear to us and so the loudest, most emergent demands get first dibs on our time and attention. But to always put ourselves last does an injustice not only to us, but also to our daughters (to our sons too). Children learn so much from us and they will model our behaviors, even if they strive not to. If you put yourself last, your daughter will one day do the same. So don't feel guilty about being good to mommy! It's the best thing you can do for her! I have one of the Happy Herbivore books and it's great. I love how the recipes are easy and quick. This sounds like a great addition to her range of books.